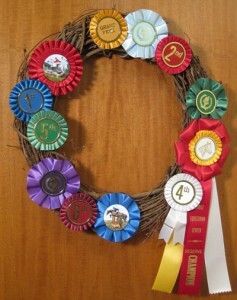 Learn to make fun, creative wreaths with all types of quality ribbons. 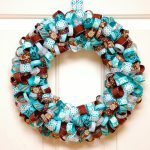 Ribbons are perfect for making your own wreaths; they are versatile, easy to use and come in different colors and patterns. There are countless ways to use ribbons to make a wreath so you can bring your own personal style to the table. And, that’s what makes it fun! Bring more of your personality to wreath-making with custom ribbon rolls. Include a personalized message for your friends and neighbors to see. Hanging a wreath on your door or in inside your home adds charm and color. Wreaths can be for a specific holiday or for year-round decoration. Either way, they bring quality to your home. Here are five different ways to use ribbons to make a wreath. Make a unique wreath out of rosette ribbons. Hot glue the rosettes to a Styrofoam, straw or wooden wreath in whatever pattern you want. The ribbons can be spread out or close together, depending on your personal preference. The easiest way to make a wreath with ribbon is to wrap a ribbon roll around the circle until it is fully covered. Wrap the wreath in one ribbon roll or two, or as many as you want, to give it more color. Add a fancy bow on the top or bottom and let the streamers flow down in beautiful waves. Here are three ways to use ribbon strips to make a wreath. Tie the strips around the wreath in simple knots. Make each strip into a pretty bow and glue each bow onto the wreath. Or take each strip and make it into a circle, then pin each circle into a Styrofoam wreath. 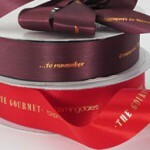 Pieces of ribbon rolls or badge ribbons cut in half will work for all these styles. Unwind a spool of ribbon roll, fold it in half and hot glue the ends together so the ribbon looks double sided. Then poke a wire through the ribbon, about 1.5 inches from one end. Accordion fold the ribbon, poking the wire through every 3 inches of ribbon. Once all the ribbon is on the wire, glue the ends together to make the last fold and connect the wire ends with electrical tape. Use any ribbon to hang. Wrap a wreath in ribbon roll or leave it bare. Then connect one end of a ribbon roll to the wreath using tape, pins or a twist tie. Stretch the ribbon across the wreath to create another point of the star. Do this until you have made all points of the star and are back to where you started. You can form two triangles to make a Star of David or make whatever star you want with as many points as you want. These are just a few ideas to get you started, but there are many more ways you can use ribbons to make your wreaths. Just remember quality ribbons make quality wreaths, so be sure to get top-notch ribbons for all your hand-made projects.